This was actually a really interesting documentary. It was all about the men in WWII whose focus was not on typical battle maneuvers, but on creating illusions to distract the enemy into attacking a charade. The artwork that was done by these men in thick of battle was just incredible, and it was an interesting side to the WWII story that I had never really heard or seen. So this is probably the worst movie pick I’ve made in a long time (although I just suggested to Max that he read the description and was the one who ultimately chose to press play… but who’s keeping score?). I honestly should have known better since I started reading the book and quit about halfway through – I very rarely do that, but something just wasn’t grabbing me. 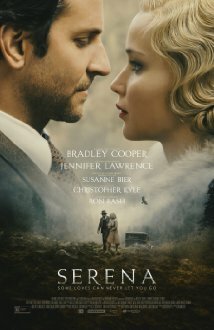 The pairing of Bradley Cooper and Jennifer Lawrence intrigued me though, but I have to say the movie was still a fail. Not a fan of this one at all. This movie was the last of the month, and it made up for our disappointment in Serena. While it’s not the most thrilling, most heart-warming, most laughter-inducing movie I’ve ever seen, it was a genuinely good all around movie with a “feel-good” type vibe. It reminded both of us a lot of The Secret Life of Walter Mitty which made its appearance in the Movie Challenge a while back. Simon Pegg did a great job, and there were many of his “lessons” about happiness that I would want to write down as well.